As soon as we saw the trailer for Namco Bandai’s newly announced title, Dragon Ball Z: Battle of Z, we realized we could possibly have a real gem of a game here, as far as Dragon Ball Z franchise goes. We asked ourselves: where could they possibly take the Dragon Ball Z games after making practically every character in the series playable? Well, how about mixing and matching them together to form super squads and fight as one? Want to recreate the Z Fighters vs Vegeta, Nappa, and the Saibamen? No problem! How about Gohan, Future Trunks, Goku, and Vegeta vs Frieza, Cell, Babidi,and Majin Buu? 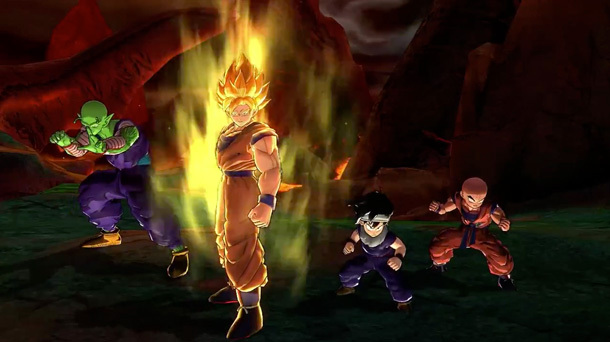 This game allows for some interesting match ups and gives fans the tools necessary to create their dream team of Z Fighters or villains. Whether you just want to team with friends to take on the story modes, or take your skills online for multiplayer brawls, this game should have everyone covered with 4v4 battles of epic proportions. No release date has been stated thus far, but we do know that Battle of Z will be available on the Xbox 360, PS3, and PS Vita. Hopefully more information regarding local co-op play will be revealed soon as well. What is your dream Dragon Ball Z team? Let us know in the comments below! Page created in 1.6561 seconds.